Spoilers ahead for A Good Day to Die! Newly inducted into the prestigious Order of the Bat'leth, Captain Klag, son of M'Raq, leads the crew of the Gorkon into the unexplored Kavrot Sector to find new planets on which to plant the Klingon flag. There, they discover the Children of San-Tarah, a species with a warrior culture that rivals -- and perhaps exceeds -- the Klingons' own, living on a planet that would be a great addition to the Empire. Klag could call in General Talak's fleet to bring the world under the Klingons' heel -- but the San-Tarah offer Klag a challenge he cannot refuse. The Gorkon crew and the San-Tarah will engage in several martial contests. If the Klingons lose, they will go and never trouble the planet again -- but if they are victorious, the San-Tarah will cede themselves to the Empire, and Klag will have singlehandedly conquered an entire world! The first tale in a glorious adventure that will be remembered in song and story throughout the Empire! 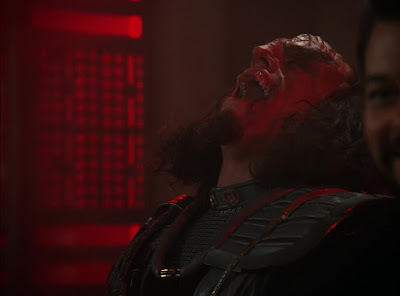 Over the years, I have known Trek fans who wanted a Klingon-based Star Trek series. Instead of following the adventures of a primarily Starfleet crew, this hypothetical series would take place on a Klingon ship and follow the exploits of a crew in the Klingon Defense Force, boldly conquering where no Klingon has conquered before. I was always skeptical of this idea, feeling that a series that doesn't follow a Federation perspective would be difficult for an audience to relate to. One-offs, like DS9's "Soldiers of the Empire" or "Once More Unto the Breach" proved that episodes focusing on a Klingon perspective could be fun, but I still felt it would be unsustainable for an entire series. 2001's TNG: Diplomatic Implausibility introduced readers to the I.K.S. Gorkon and its crew, many of them from previous Star Trek episodes, along with a few new creations for the novel. Led by Captain Klag, first seen as a lieutenant in the TNG episode "A Matter of Honor," the Gorkon was a newly-commissioned Chancellor-class warship, outfitted with the latest in technology and boasting a complement of thousands of troops. The stage was set for a new Star Trek book series, focusing not on the usual Starfleet crews, but on the warriors of the Klingon Empire! Captain Klag, known for throwing his head back and laughing heartily. Like, A LOT. After being featured in Keith DeCandido's The Brave and the Bold series, Captain Klag and his crew graduated to headliner status with this novel, A Good Day to Die, the first in the new I.K.S. Gorkon series. Would this fierce crew of Klingon warriors be able to carry their own book series, guided by the able writing hand of Keith R.A. DeCandido? For my money, the answer is a resounding yes! If this first novel is any indication, this is the perfect medium to tell the story of Klag and his crew. While my initial misgivings had to do with my belief that a Klingon crew would be difficult for readers to empathize with, DeCandido managed to change my mind with a colorful cast of characters who are as diverse a group of Klingons as a Federation crew would be. This novel features an interesting story in which the crews of a number of Chancellor-class warships set out to explore the Kavrot sector, seeking new worlds to conquer for the Empire. The titular warship, Gorkon, comes across a world inhabited by a species that calls itself The Children of San-Tarah. The San-Tarah turn out to be warriors worthy of respect by the Klingons, and soon an agreement is reached: a series of contests will be held, and whichever group wins the most contests will have the right to determine the fate of San-Tarah. Of course, the contests come down to a tie, with the ultimate fate of the world determined by personal combat between Captain Klag and the leader of the Children of San-Tarah. I found the story to be gripping and exciting, with twists that I wasn't entirely expecting. I also did not expect this novel to end on a cliff-hanger, thinking that each story within the I.K.S. Gorkon series would be stand-alone with elements running through the series. However, while this novel ends with the leader of the San-Tarah defeating Klag due to his lack of proficiency with a bat'leth thanks to a recent arm replacement surgery, the story continues in the next book with the General who is in charge of the Kavrot sector mission ordering Klag to conquer San-Tarah anyway. While some may complain that we don't get the entire story in one novel, I still feel that the events of A Good Day to Die are self-contained enough that we get a fully-formed story within its pages. A Good Day to Die is an excellent start to the I.K.S. Gorkon/Klingon Empire series of novels. 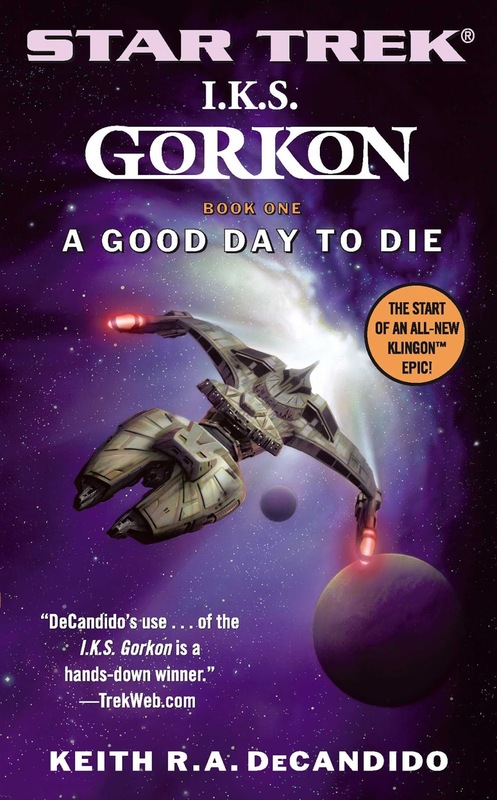 While we did get previous adventures of Klag and the Gorkon crew in Diplomatic Implausibility and The Brave and the Bold, it's great to see this eclectic group of Klingon warriors get their own novel series. It's unfortunate that the series was so short-lived, as Keith DeCandido's excellent writing is the perfect match for this terrific cast of characters. Next up is my review of TNG: A Time to Kill by David Mack!